"Above all, the handling astonishes. Everything you've heard is true"
On paper, 125bhp doesn't sound like much of a recipe for excitement, but given the fact that there's only 550kg to move about, it's more than enough to paint a monster grin across your face. With a power to weight ratio that betters a Porsche Boxster or a Subaru Impreza WRX, this Seven Roadsport will accelerate to 60mph in 5.9 seconds. Despite the devastating performance of cars like the R400 version, Caterhams are more to do with the purity and feel of the handling than the straight line wallop. The 125bhp model we're looking at here will get to a top speed of around 105mph if you're really keen but you'll get plenty of thrills at speeds far lower than this. Replacing the K-Series engine after 15 years of service, the bespoke-tuned 1.6-litre Sigma powerplant in this entry-level Seven has been developed to take the driving enjoyment of this car to even greater heights thanks to a perfect blend of meaty torque, stiff lightweight construction, and exceptionally smooth power delivery. And the price? A very manageable £15,995. 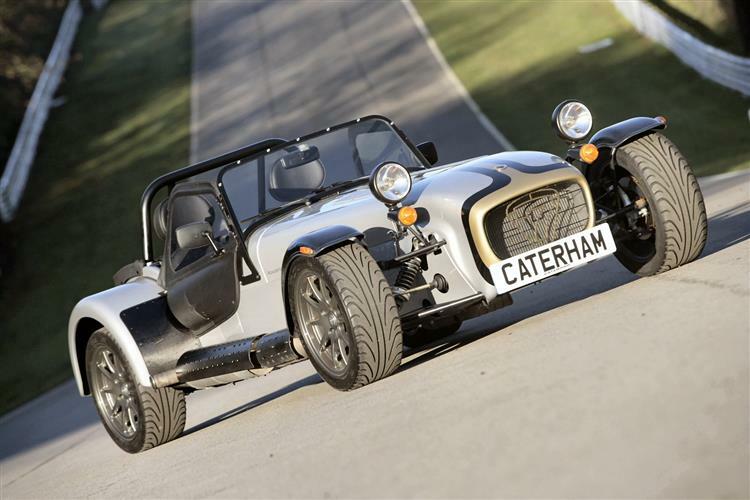 All Sevens depreciate very slowly and if you were thinking of buying a car as an introduction to track day driving and then trading up in a year or so, there's really no better option than this particular Caterham. It offers tactility and finesse without huge bills. A lightweight car is that much kinder to its brakes and tyres and doesn't quaff vast quantities of fuel during a session of spirited lapping. In the right hands, a Seven Roadsport 125bhp will be able to embarrass some seriously expensive machinery around most British circuits. Only the really quick tracks like Silverstone and Thruxton will betray its slight lack of lung capacity. The driving experience, while not as full-on as the more powerful variants, is still something to behold. The exhaust assaults you with a sonic barrage quite at odds with the engine's modest capacity. Despite years of experience in all manner of exotic cars, my mouth has suddenly gone a little dry. My size twelves feel like clown shoes in the diminutive pedal box and my thighs rub against the bottom of the steering wheel. It genuinely feels as if you've strapped the car on rather than vice versa. On the move, you're astonished by the directness of the steering. Think of a line and the Seven is on it, the dinner plate sized steering wheel sending the most delicious feedback to the driver. Everything seems alien. You can watch the front suspension doing its stuff and feel the car delicately shifting balance, your body mass perched almost on top of the rear axle. At first, each tentative thrust of the accelerator merely results in gales of disbelieving laughter but confidence quickly builds followed by a feeling of invincibility. Narrow country lanes disappear in a blur, the insistent bark of the exhaust rebounding off verges. The downside of Caterham ownership is the impracticality. Loiter around the showroom in Caterham (strangely enough) and you'll encounter numerous hardy types who run one as their only car, dismissing as fey any complaints that it's a bit uncompromising. The doors only barely justify the description, being vinyl flaps that affix with a popper and to which the door mirrors are attached. The rear view can therefore be a little fuzzy, the best tactic being to travel faster than any posterior hazard. Driving a Caterham solely on the road is a little like buying a top line set of thirteen Ping golf clubs and using them exclusively at your local pitch and putt. You're barely scraping the surface of the potential available. On a track, the car suddenly makes all kinds of sense. The tiny pedal box makes dancing between the pedals a delight and the stubby gear lever can be palmed around the six gears just for the sheer tactility involved. Above all, the handling astonishes. Everything you've heard is true. Tail slides that would usually generate entreaties to your maker in certain other cars become sought at every opportunity in the Seven. If you buy into Caterham 'less is more' philosophy, then the Seven Roadsport 125bhp seems a logical extension. The more you pay, the less car you get and the more marginal the value proposition. This entry-level Seven offers drivers in their early twenties an unprecedented amount of capability for a surprisingly reasonable price. Get one of these and next time some self-professed 'expert' starts talking about car handling, you'll be able to come from a rather informed position.